Tuesday April 8th : TSOT Ruby on Rails Project Night! TSOT’s Ruby on Rails Project Night brings together the brightest minds in Toronto’s programming community for a night of dynamic presentations on the latest Ruby and Ruby on Rails projects. Mike Bowler (GargoyleSoftware) returns armed with a fist full of meta-programming as he looks at “Diving into meta-programming with Date.once”. Kristan ‘Krispy’ Uccello will examine the architecture and design of the Domainer.com platform as he investigates, “Web Development Demons: Why it can be hard to do something simple”. Leila Boujnane, co-founder and CEO of Idée Inc., will join us to discuss and demonstrate her company’s highly successful image search APIs. We are also pleased to have Morph Labs and the Morph eXchange join us as our official drink sponsor for April’s event – therefore BYOB is only necessary in extreme cases! This event is free but space is limited; please reserve your spot by emailing corina.newby@tsotinc.com. If you would like to submit a presentation idea or learn about sponsorship opportunities at future TSOT events, please contact Corina at (416) 908-6082. This April is gearing up to be a fantastic month for Toronto Ruby on Rails Aficionados… TSOT, Inc. returns on April 8th with the fourth TSOT Ruby on Rails Project Night, plus we have arranged an exciting opportunity for TSOT fans to attend the April 7th Obie Fernandez Ruby on Rails workshop! Our last event featured a host of dynamic presentations, and you can now view all past TSOT Ruby on Rails events on our website at www.tsotinc.com/events; we have also posted slides and links from our gracious presenters – Enjoy! With the growing success of TSOT’s RoR event, we are pleased to announce that we have been invited to join the IT360 Conference being held in Toronto on April 7-9, 2008 as an “off-site” event (www.IT360.ca). TSOT Ruby on Rails Project Night will be held on Tuesday April 8th at the usual spot – the TSOT development office located at 151 Bloor Street West. We are also pleased offer two Ruby on Rails workshops hosted by Obie Fernandez, taking place at the IT360 Conference on Monday April 7th. As a ‘loyal patron’ of the TSOT Ruby on Rails Project Night, we are able to offer you a discounted rate for both the Obie Fernandez Ruby workshops, as well as the entire IT360 conference. Please see below for further details about the workshops and your TSOT discount code. As for the TSOT Ruby on Rails Project Night on April 8th, we are pleased to have Morph Labs (www.morphexchange.com) join us as a drink sponsor (so BYOB is only necessary in extreme cases!) and the schedule of presenters will be released next week. We are expecting a great turn out, so please reserve your space TODAY by emailing corina.newby@tsotinc.com. We are also looking for future presenters; contact Corina at (416) 908-6082 if you are interested in getting involved. Thank you again for your support and stay tuned for further details about April’s exciting event! Spend a Day With Obie Fernandez: Pioneer Ruby on Rails Developer! It’s a Ruby on Rails extravaganza on April 7th at IT360 Conference & Expo, the premier event for IT professionals. There are two educational tutorials (each 3 hours long) instructed by Obie Fernandez; read on for further details, including special pricing for fans of the TSOT Ruby on Rails Project Night. As a TSOT fan, you receive a 25% discount. So it’s only $373.50 to spend the day with Obie Fernandez! This includes both the morning and afternoon tutorials. ++ Early bird rates have been extended for TSOT fans until April 6, 2008. Interest in Ruby on Rails has grown incredibly, as “Rails” has made its way into mainstream computing. Interest is growing in-part because of how much fun & productive programming can be when you use a framework that emphasizes common sense, elegance and readability. Obie Fernandez will present two tutorials based on his bestselling book, “The Rails Way”. The morning session provides a basic introduction to the main Rails concepts and programming techniques. In the afternoon, material will be given about effectively building and deploying real applications using Rails. ***Special Book Give-Away! Three attendees during each tutorial will win a free copy of Obie’s book, “The Rails Way”. Register today and you may be one of the six lucky winners. Obie Fernandez, CTO of HashRocket, a boutique web consultancy and product shop in Jacksonville Beach, Florida. Formerly, a senior consultant at ThoughtWorks, specializing in complex custom enterprise software projects, Obie is a pioneer Ruby on Rails developer and author of best selling book, “The Rails Way”. He contributes regularly to the Ruby on Rails podcast, and is editor for Ruby community portals. TSOT recently held another successful installment of their monthly Ruby on Rails Project Night for Toronto’s tech community. The highly anticipated event was the third of its kind for TSOT, Inc., local developer of scalable peer-to-peer networks, and over 40 of Toronto’s ‘tech elite’ were in attendance. With a variety of dynamic presentations on a broad range of projects in Ruby and Ruby on Rails, the TSOT Ruby on Rails Project Night delivers a unique opportunity for the Toronto programming and development community. This month’s TSOT Ruby on Rails Project Night welcomed a host of presentations from various Toronto developers, including both fun and functional applications being built in Ruby on Rails. Mike Bowler, president of Gargoyle Software and previous presenter, returned to share his technical wisdom on “Exploring the magic behind dynamic finders: diving into ActiveRecord::Base.method_missing”. Following this, local developers Robin Ward and Mike Drach brought their unique sense of internet humour to the table with a look at “RJS: a love and hate affair” in their work with the online RPG ‘Forumwarz’. Finally the feature presenter for the evening Ilya Grigorik, Chief Architect at aideRSS, Inc., demonstrated the challenges involved in “Taming the RSS beast” related to the launch of www.aideRSS.com. Given the balance between technical expertise and innovative ideas, the evening’s presentations struck a very positive chord, with audience members eager to take the opportunity to ask questions, share solutions, and discuss the challenges associated with each of these dynamic Ruby on Rails projects. corina.newby@tsotinc.com – this event is free but space is limited! event, please contact Corina Newby at 416-908-6082. Stay tuned for our schedule of speakers, to be released next week! Greetings from the windy city! TSOT and FraternityLive/SororityLive are in Chicago this week at the Mid-American Greek Council Association and National Black Greek Leadership Conference, alongside almost 2000 Greek students and advisors. With hot topic sessions ranging from recruitment techniques and risk management to relationships, there certainly seems to be something for everyone. FraternityLive and SororityLive have been getting a lot of attention as both Chapters and Greek Councils seek out new technologies to help them organize and communicate with their members. In addition to getting to meet some incredible Greek leaders from all over the Nation, FraternityLive and SororityLive garnered a lot of excitement about the new Headquarters, Chapter, and Council level product packages, especially the Family Tree charting, SMS text messaging, and Page Builder applications. The reasonable pricing model also appeals to organizations of any size because it is based on membership numbers; meaning that even a small Chapter or modest Greek campus can benefit from the FraternityLive and SororityLive private networks. One of the best chords we’ve struck has been through the introduction of our facebook application, which allows any organization to capitalize on the popularity of the social network by using it to direct traffic to their private system. From the great response FraternityLive and SororityLive received at this week’s MGCA/NBGLC, TSOT is looking forward to bringing the FraternityLive and SororityLive network tools to Greek organizations and councils; helping the Greek community to establish a stronger online presence and improve their member management and communications. Thank you to all who came out for the TSOT Ruby on Rails Project Night this Tuesday evening. In spite of the snow, we had a cozy audience of over 30 for some fantastic presentations from top Ruby and Ruby on Rails developers. Another round of thanks to our feature presenters: Rowan Hick, Mike Bowler and Luke Galea for their indepth demonstrations as well as their answers to audience inquiries. The ‘open discussion’ atmosphere yielded some great results, and we look forward to more ‘collective’ problem solving during future events. Please refer to the links below for more information about our presenters, and stay tuned for our announcement of the March 11, 2008 schedule – our Third TSOT Ruby on Rails Project Night promises to be another great opportunity to network with Toronto’s tech community! Thank you again to all who came out and for those who didn’t make it, save your spot for the next event March 11th! 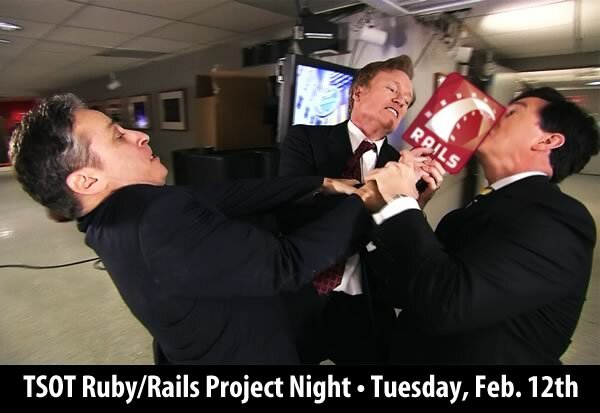 TSOT Ruby on Rails Project Night… Tonight! Email corina.newby@tsotinc.com to inquire, and for those who have reserved their spots, see you tonight!